PS&S was engaged by Horizon Blue Cross Blue Shield of New Jersey to provide MEPF services for their Headquarters Building at Penn Plaza in Newark, NJ. This included 9 floors of demolition and complete renovation/fit out of approximately 400,000 sf. The project was phased to allow multiple moves while maintaining existing operations. PS&S's engineering group worked closely with and coordinated the project in conjunction with another architectural firm which had been previously engaged by Horizon. As a result of this work, PS&S was then hired to provide architectural design and construction services for two other Horizon facilities in New Jersey. The major challenge facing PS&S's architectural design team was a very irregularly shaped floor plate that created many difficult issues of planning and efficiency. Existing bay dimensions, column grids, core layouts and restroom facilities all contributed to the design challenge. Also, periodic program and headcount modifications were addressed throughout the design and construction phases to meet the client’s needs. PS&S's architectural team needed to coordinate with outside engineering and specialty design consultants on a daily basis to meet the project's aggressive design and construction schedule. The PS&S team presented a series of plan options in short order that met the initial program needs for the space. Through a close working relationship with the client and other team members, and regular and frequent design meetings, we were able to arrive at an approved scheme quickly. Face to face and/or teleconference meetings took place at least once a week. Plan modifications were presented and made at the meetings, which saved considerable back and forth time and was key to meeting Horizon's schedule. 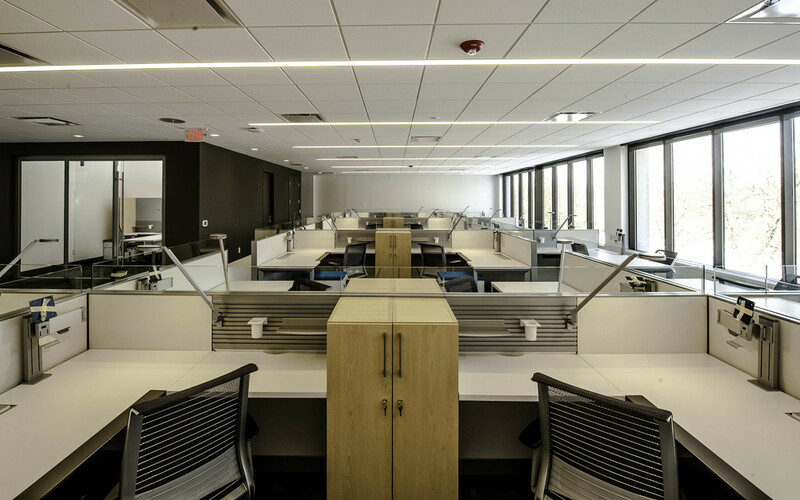 In the end, the finished space is a state-of-the-art work environment that maintains the client’s workplace standards while meeting their budget and schedule expectations.